The Ristorante Tullio was founded in 1945, the same year the Brioni fashion house was established in Rome around the corner from Tullio. This high-end eatery, which has catered to the likes of Clark Gable and Henry Fonda, serves a small number of ever-changing menu items determined by which ingredients are available and ripe for eating that day. A specialty of the house that is always on the menu is the mozzarella di bufala, which is received daily from a producer in Naples. The restaurant is located at Via San Nicola da Tolentino n. 26. This evening my wife and I sat down to watch Roman Holiday, the William Wyler (Wikipedia, IMDb) directed film, which surprisingly neither of us had seen previously. Though clearly not the weightiest of cinematic fare, it was nonetheless a fun way to spend a couple of hours. Audrey Hepburn (Wikipedia, IMDb) is charming, exquisite and radiates stardom in her first Hollywood role, playing Princess Ann, and she wins a Best Actress Oscar for her work. Gregory Peck (Wikipedia, IMDb) is a solid counterpart to her as a news reporter who provides a day in Rome free from her burdensome royal obligations. 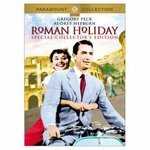 Rome itself is the third star of the film, though it doesn't overwhelm, but rather is simply a well integrated romantic and memorable backdrop to the day's antics. If you haven't seen the movie yet, or even if you have, you'll enjoy spending time with Hepburn, Peck and a much more car-free Rome than we know today. Featured in the NY Times today is an article by David Farley about Calcata, a small town outside of Rome, noteworthy not only for it's rugged beauty, but also for the fact that it's become home to a community of bohemians and artists. If you're looking for a unique day trip out of Rome, Calcata should be on your itinerary.